I went into my local township building Monday to settle up my local income tax bill. I had filed for an extension of my federal and state taxes back in April because of my father’s unexpected death a few weeks before the tax filing date and the need to deal with his funeral and with arranging for care for my widowed mother, who has alzheimers, had taken up all my time. I paid my local tax bill on time though, because at 1 percent of income it is a relatively small amount and was easy to get out of the way. I just made a rough estimate and dropped a check with the one-page form in the mail, figuring I’d settle the amount due after my federal taxes were completed. So, after finally getting my federal and state taxes done, I went to the town hall to settle up. It turned out I’d overpaid my local taxes by $165. Ordinarily if I’ve overpaid my local tax, for example by paying too much in the four required estimated tax payments, the township simply applies the overpayment to my next tax year’s estimated payment. Not so this year. I was told that the collection of taxes by all the townships in Montgomery County had been privatized — taken over by a private accountancy firm called Berkheimer Tax Administrator, a company expressly created to bid for outsourced collection operations of local towns, school districts and counties, for a fee. After calling Berkheimer (and waiting through 15 minutes of listening to god-awful Muzak), I finally got a tele-clerk, who told me that there was nothing she could do. I would be issued a check for the overpayment, and would be charged a late fee for my late quarterly payments. She said I could write and explain about my father’s death and see if they could “do anything,” but she didn’t sound optimistic. I’m not either, and I sure don’t want to go through any more of those 15-minute Muzak experiences (which seem calculated to deter callers)! This tax privatization business is sure nice work if you can get it. And Berkheimer got it because the professional association of CPAs in the state lobbied the Pennsylvania state legislature heavily in 2009 to get a law passed mandating (got that? mandating!) that all townships in each county in the state get together and hire one organization to collect all their taxes. My county, Montgomery County PA, which opposed the bill, hired Berkheimer. So did a lot of other counties. The company, created expressly to capitalize on the new law, has 17 offices dotted around the state according to their website, to collect the taxes for hundreds of towns, school districts and other local entities. How much are they getting paid in total for all this “work”? That would be hard to ascertain. The company is private, and is not subject to any sunshine laws. Think about that. Local taxation has always been one of the bright spots of open government until now. You could go into the registrar’s office and find out what someone’s house was taxed, or find out exactly what taxes were being paid by a local company. Since no government agency is monitoring Berkheimer’s activities or those of other similar privatizers of the tax collection business, though, doing that kind of research now is almost an impossible task. A reporter trying to dig up this information would have to go to each taxing authority to find out how much their residents and local businesses owed in taxes each year, and then find out how much of a percentage cut Berkheimer was getting in that county for collecting all that money (the local jurisdictions got together in each county as an adhoc committee to negotiate a deal with the company, but good luck locating anyone from that committee who’d be able to tell what the terms were.) I lucked out: The chair of the committee in my county was the township manager for Montgomeryville, PA, and he gave me the 1.39% figure. Now the proponents of privatization always argue that it is a more efficient way of doing things than having “overpaid” public employees do that job, so I wondered: is this privatization of a basic function of local government saving money? I called the tax collection office at my town and asked Ed Shay, the head of that office. “Well, they’re laying off two people this year,” he said. “One of them is me. I’m gone at the end of December.” That’s two employees, and possibly a third after the transition is completed sometime next year. He also agreed that he had heard a lot of reports from residents about poor service from Berkheimer. As the soon-to-be-furloughed tax director Shay added, “It’s always better if your tax collector is closer to the people paying the taxes.” He explained that this proximity makes it easier to catch cheating, and also easier to help taxpayers when there are problems (like mine). Just one example: figureing out one’s local tax bill can be complicated — for example, someone who works in nearby Philadelphia, and pays a 4% tax to that city, can have that payment deducted from the local bill, thus wiping out any local tax completely, but this can be hard for a number-challenged resident. The friendly tax staff at the township were always happy to do the work right in front of you at the counter — for free. Berkheimer isn’t even located near the township, and offers only a website to work with. So what’s ahead? Republican legislatures are mandating privatized tax collection for local taxing authorities. 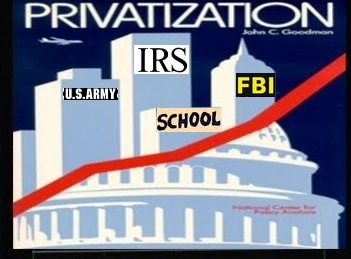 We already have privatized prisons, privatized schools, privatized highways, privatized police. Will things move upwards now to the state and federal level? How long before the Berkheimer-type companies are collecting our state taxes? And with some Republicans pushing for an end to the IRS, how long before some Berkheimer clone gets the gig for collecting our federal taxes? By then, I would suspect that when you call the company with a complaint about your taxes, you’ll get someone with a strong Indian accent calling him or herself Richard or Marilyn answering from a phone center in Bangalore.